In this era where science fiction has become primarily synonymous with the visual medium and young adult books it is refreshing to have another scholarly narrative history of the genre, a look at its heritage which stretches back to ancient Greece. The History of Science Fiction (2nd Edition 2016. 524 pages) is written by Adam Roberts, who has updated the book from its first edition adding in extra chapters to keep the text relevant. The book forms part of the Palgrave Histories of Literature. 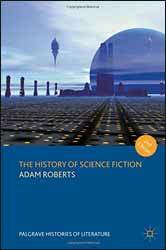 Definitions are important and Roberts goes a long way to prove that as a genre, science fiction has a more freewheeling anarchic approach to ideas, where technology is a force for freedom rather than a limitation on the genre. Occasionally he can go a bit off track adding Kafka’s The Trial as a work of science fiction, even though the book contains neither novel science nor any new invention which has an impact of the unfortunate ‘K’. On the other hand there may be a passing justification for including Metamorphosis, but including the Trial opens up the definition to encompass almost any novel with some fantastical elements. In fact Roberts allows for this when he discusses the rise and rise of the young adult novel represented by series which have become enormous successes, Harry Potter and The Hunger Games. Given that he has chosen to examine a specific genre over such a long period means that there has had to be some restriction on what is the book's remit. So, whilst there is a peppering of science fiction from other countries, the book's focus mostly remains on western science fiction, its relationship to established religion. While the two were often in conflict, science fiction was also able to subvert its iconography to create the messianic superheroes of the twentieth century. As well as working as a professor of nineteenth-Century Literature, Roberts is also a published science fiction writer with sixteen novels to his name. This allows him to straddle both the requirements of an academic book and the need for the reader to find the text entertaining and confrontational. You may not agree with all of the author’s assertions, but it will make you think. There are some strange omissions from the book, authors which I thought would have had an automatic nod, but then a lot of the authors which are included are only given a cursory wave as the book passes them by in its mission to try and tell a coherent story. There has not been a definitive history of science fiction written for the last thirty years and on that basis this book is likely to remain relevant for years to come, regardless of whether you agree or disagree with the author's central premise that this is a genre born out of the tension between the orthodoxy of religion and the chaotic nature of man and his inventiveness.